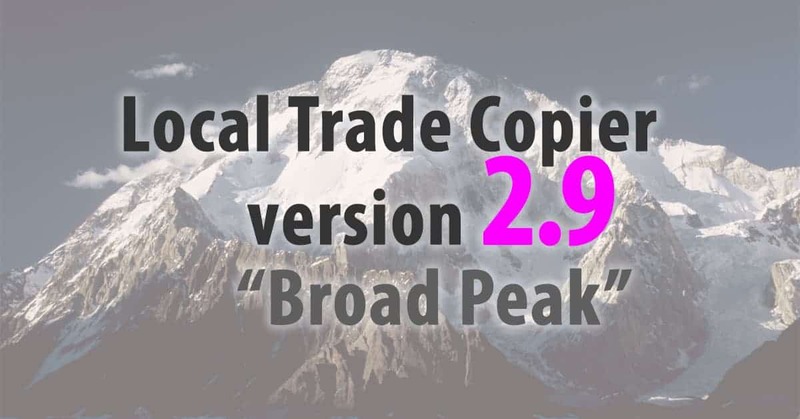 Local Trade Copier 2.9 "Broad Peak"
What’s new in LTC v2.9? Several new features has been added to LTC, but the most important thing to mention is that LTC is now much more reliable than it was before. It was improved significantly and now it’s main copy trading engine works more fluently. Even if I was never able to reproduce the same error on my computers, apparently many of my clients had this. So I have re-wrote the main code responsible for this and now LTC works much better. This means LTC should not delays anymore and it should copy trades immediately. Obviously delays might occur for other reasons like price being too far or your account will have not enough margin, etc. So keep your eyes closely to the messages in the EXPERTS tab if you notice that some of the trades are not being copied right away. Here’s a good article on how to read log files. LTC will now show you image that explains how to deal with some most common mistakes that people do when running the software. I know that most of you are lazy and do not read instruction manual (no judging, I do not read manuals either unless something breaks ;-), so I am adding a few visual explanations on how to deal with some issues you might face. For example if you forget to enter the license key you will get a picture that will show you where you need to enter it. Cool, right? Previously you had to input the license key every time you start the EA. But now, you can do this only once on each MT4 terminal and then later just leave license key parameter field empty. It should pick up your license key automatically from the memory even after you restart the MT4 or computer. Server EA as well as Client EA is saving its last used parameters into file every time you start the EA. This allows you to load the last used settings anytime later. But the Server EA was missing to save the value of the TradeComment parameter. Now this error is fixed. LTC version 2.9 is compatible with the version 2.8. This means that you can update one EA at a time in case you do not want to update all of the EA’s you are running. Client EA has improved currency suffix auto-detection system which makes using it more convenient on many brokers that use symbols with suffix for trading. If you will use Client EA with AcceptTradeCloseSignals set at FALSE (to avoid trades being closed after they get closed on the master account) and there will be some trades NOT closed because of this, the EA will record their numbers into memory and later will leave them running even if you switch back the AcceptTradeCloseSignals to TRUE. To close them you will have to interfere manually because EA will not manage them anymore. 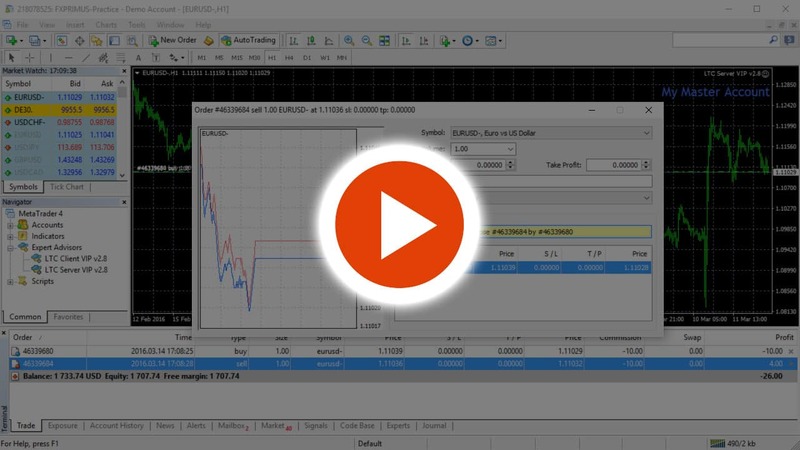 Local Trade Copier helps retail Forex traders and account managers replicate trading actions between multiple MetaTrader 4 accounts on the same computer so they won’t need to repeat the same transactions on each MT4 platform individually.